This Sterilite medium clip box comes in a set of 4. Use the clip box to hold a variety of items around the house. 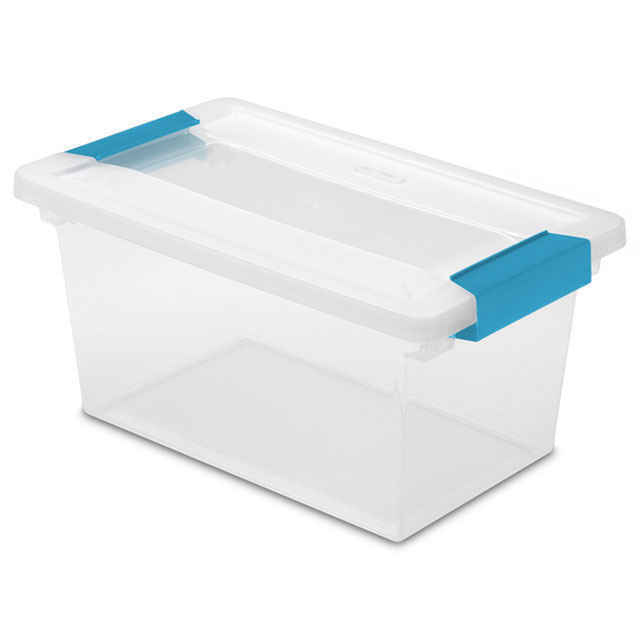 These boxes are great for holding cleaning supplies in the kitchen or in closets. These containers are also great for storing snacks and other supplies while camping or travelling. Kids can use the Sterilite medium clip box (also known as Sterilite 1962) in their rooms as a kids art storage box. These Sterilite clip boxes are small enough that they can be stored underneath beds or in closets. These Sterilite medium clip box containers are see-through allowing you to easily find exactly what you are looking for. The lids are also transparent with clips that snap closed, keeping all of the items secure. Like all Sterilite clip boxes, the medium clip box boxes can be stacked on top of one another in closets or on shelving. Save with bulk sizes on this Sterilite medium clip box.